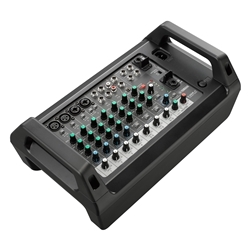 Because the EMX2 is both a mixer and a power amplifier, you only need speakers and mics to have a fully functioning sound system. This makes it easy for newcomers, and even first-time users with no previous audio experience to easily configure their own sound reinforcement system. The EMX-2's all-in-one design concept ensures that by just plugging in a single power cable and making a few simple, intuitive connections, anyone can be their own sound engineer.